Dear Family and Friends: We share our family news again and enjoy your cards and letters too. New arrivals and glad news: My sister Marion's daughters both had babies this year. Lynn and Jim had a girl and Theresa and Jim had a boy. On Bob side, Lana (Marilyn's daughter) and Andy had a baby boy. Bobs family: Bob's Dad is living in Tenino with brother Perry, Cathy and Nicholas. They put up a new mobile home on their property so Dad could have his own space. In the near future, they will sell Bob's folks home in Tacoma. Nicholas is just recovering from a very serious bone infection in one of his legs. Carol: Last Spring I bought a beautiful 97 red Mercury Sable and I love it. I am still taking piano lessons and love my music. My friend Joanne and I enjoy going to musicals at the Fifth Avenue in Seattle. I am busy with my church as a lector and a Stephen Minister. Every weekend we join our friends for dancing at the Elks Club. Recently I've been learning more about computers with Bob as my technical support. 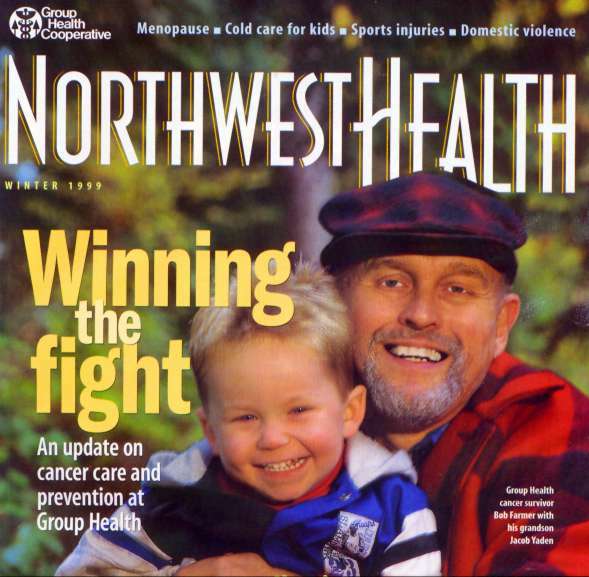 *Note: We just received the Winter 1999 issue of Northwest Health magazine. Click here to see the front cover. A very pleasant part of my Christmas Eve. learned how to use Bob's computers. Cathy and her boy friend, Shaun, took eight children to the Roller Hockey Nationals in Des Moines, Iowa. They did very well again this year as their teams won a Gold, Silver, and Bronze medal in their age groups. The children are 8 to 13 plus little Jake. Roller Hockey is a big part of their life. Belinda, Robert, and Larry: Belinda has been at Jeanne Renee Salon in Silverdale for one year. Larry, a third grader, also enjoys roller hockey, bike riding, and snow boarding. Larry also went to the Roller Hockey Nationals with Cathy and Shaun. Dan: Since September 1996, Dan has been a Peace Corps volunteer teacher in Mlowe, Malawi, Africa. He is on his way home now. What an experience for him! Now he is with 2 Peace Corps volunteer friends traveling though Africa and Europe. They plan to spend Christmas on the Island of Cyprus with the family of one of the group. He will arrive home about January 9th. Our last contact was on December 8th via a phone call from South Africa near the border of Namibia. Dave: He works hard for St. Vincent de Paul. He still loves tennis and often enters tournaments. He has lots of friends and enjoys being Uncle Dave to Jeremy, Larry, and Jacob. We are a very close family with Cathy and kids also living under the same roof. Pets: JD, (12-year-old wiener dog) and Fantasia (9-year-old cockatiel) Cathy's two cats and Jeremy' s hamster are doing fine. We lost Jeremys cat Fluffy when she was run over in front of our house. We miss Fluffy. We wish you a Blessed Christmas and a New Year filled with love, happiness, peace, and good health.